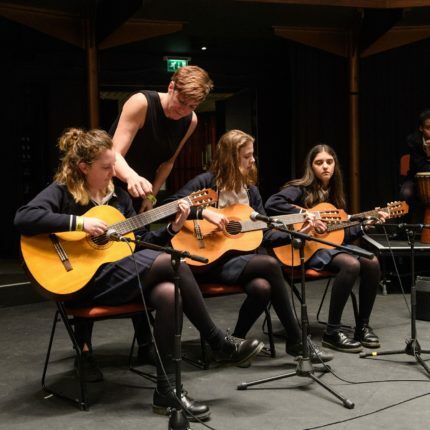 The Lewisham Music Bursary Scheme aims to provide support to those whose financial circumstances may prove to be a barrier to accessing music education opportunities, and who are not able to access support or assistance from other sources. a commitment to continuing and/or future regular participation in Lewisham Music’s ensemble and/or performance programme. Bursaries may be used to cover in part or in full the costs associated with a Lewisham Music or Lewisham Music hub partner instrumental or vocal learning programme, instrument hire or one-off awards to cover the costs of activities such as a holiday course, examination entry, learning resources or a music project. The level of funding allocated is assessed on a case by case basis at the discretion of Lewisham Music, and it is subject to availability of funding. Awards are available at three fixed points during the school year. Bursaries commence from the beginning of the following term, are for a minimum of one term and a maximum of three terms, and will be reviewed at the end of the award period. Renewal is subject to the pupil’s attendance, behaviour and progress. Applications should be made in the first instance by the child’s parent or carer and should include statements of support from the music tutor and/or music teacher and headteacher. If offered a bursary, parents/carers will be asked to provide evidence of family financial circumstances, before the bursary can be applied. Decisions will be made by a panel made up of Lewisham Music senior managers and trustees. There is no right of appeal against final decisions made by the Bursary Panel. Feedback will be provided to all applicants. Re-submitted applications will be considered if family circumstances change, but only on two further occasions. Applications should be discussed in advance with the applicant’s music tutor or teacher before submitting the application form. Please return the application form by the date shown above to info@lewishammusic.org with Bursary Application in the subject line, or by post to Bursaries, Lewisham Music, The Green Man, 355 Bromley Rd, SE6 2RP.